Or you’ve read this months MagPi magazine and seen the article there! Recent years have seen a resurgence in various activities to resurrect or re-create some of the very first computers that were built. The National Museum of Computing on the Benchley Park estate is home to many projects – and recent additions have been “Colossus” which was designed to break the Lorenz cipher and started working in 1943-1944, and the WITCH computer which came online in 1951 and was recently rebuilt and “rebooted” using most of the original parts in November 2012. WAIT Pause for the given number of centiseconds – Also causes a display update. A CESIL program is essentially three columns of text. The first column (which can be blank) is the label – it’s a placeholder in the program which you can “jump” to from other parts of the program. The middle column is the operator – that’s the instruction to execute, and the final column is the operand – this is data for the instruction to use. This data may be the name of a label if it’s a jump instruction, it may be a number or it may refer to a named memory store, or variable. The CESIL machine has one register or accumulator. 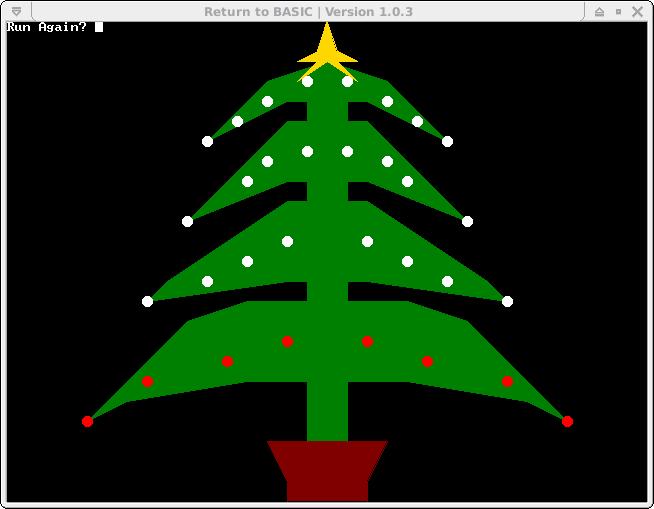 This implementation is limited to a maximum of 256 program lines and 256 variables. My extensions to the CESIL machine have included 2 more registers to hold the row and column locations of the lamps and a colour instruction to set the lamp colour as well as a subroutine facility. #       Make the tree silver! This CESIL interpreter is written in RTB (Return to BASIC), so the first thing you need to do is install the RTB interpreter if you don’t have it already. You can stop any running CESIL program with the Q key on the keyboard, and pause it with the spacebar. CESIL programs can be written using any text editor (e.g. nano, vim, etc.) and you can type in upper or lower case – they get translated to upper-case at load time. Filenames should have a .csl extension to them, but you don’t need to type that when loading a CESIL program into the interpreter. And during December and January 2012, there is a little fun competition running to win one of my Raspberry Ladder boards – but to find out more about that, you’ll need to go and read the MagPi magazine article, or just email me (projects@drogon.net) with your programs by the 25th of January, 2013 and I’ll make the selection by the end of January. Nice to see more memories of CESIL. I’ve been keeping the language alive on Windows since the late 90’s with compilers in Visual J++ and C#. I have a port of my compiler/runtime in standard Java that should work on the Pi but haven’t tried it yet and a half finished Java SWING base IDE – just the debugger to complete. This reminds me of a CESIL interpreter that I co-wrote with a school friend (honestly, he wrote more than I did!) around 1983 to run on the BBC Micro. At the time our CESIL programs were being hand coded on paper coding sheets and shipped off to ICL for processing, answers in class next week! The interpreter was a revelation for our school CESIL projects as we weren’t waiting a week only to find out that we had written something buggy. Good luck with all this work guys – I no longer feel the need to develop in the language but knowing that others are still having fun with it warms the heart!